NEW YORK (AP) — A presidential aide’s explosion of profanity while talking to a reporter about his new White House colleagues tested newsroom leaders Thursday, forcing decisions about whether to use the graphic language or leave much of what he said to the imagination of readers and viewers. Anthony Scaramucci, the incoming White House communications director, aimed his tirade at chief of staff Reince Priebus and chief strategist Steve Bannon. An account of his conversation late Wednesday with Ryan Lizza of The New Yorker was published in graphic detail Thursday afternoon on the magazine’s website, complete with expletives and anatomical references. Scaramucci used the language in suggesting to Lizza that Priebus had leaked information about him, and that Bannon was more interested in advancing his own agenda than President Donald Trump’s. Following The New Yorker’s lead, The New York Times printed all of Scaramucci’s words. Times editors, including executive editor Dean Baquet, first discussed whether it was appropriate to do so, Clifford Levy, the newspaper’s deputy editor, said on Twitter. Levy said the Times concluded that it was newsworthy that a top Trump aide would use such language, and its readers shouldn’t have to search elsewhere to find out what Scaramucci said. Julie Bykowicz and Jonathan Lemire of The Associated Press wrote that Scaramucci was “exposing West Wing backstabbing in language more suitable to a mobster movie than a seat of presidential stability.” The service referred to Scaramucci’s description of Priebus as a “f—— paranoid schizophrenic,” using the dashes instead of spelling out the word. That was the AP’s only direct reference to a profanity. 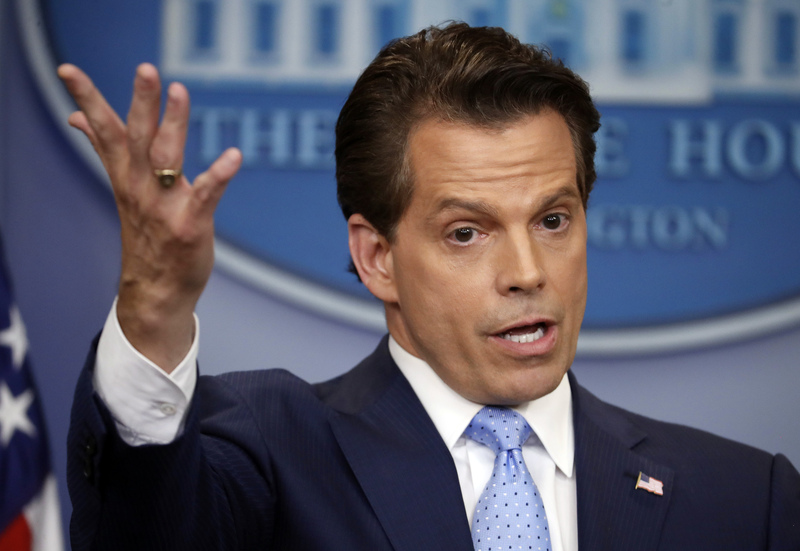 The AP’s rules prohibit use of obscenities, racial epithets or other offensive slurs “unless they are part of a direct quotations and there is a compelling reason for them.” Scaramucci’s words satisfied the first part of that restriction, but editors concluded there wasn’t a compelling reason to use the profanity. Television networks, knowing they would have to say the words out loud, generally stayed away from them. Anderson Cooper, in an interview with Lizza, let him describe the reference to Bannon. “You’re going to make me read this one?” Lizza asked. “Use your judgment,” Cooper replied. TV anchors used variations of “expletive” and “bleeping” in reading the words.